Less is invariably more in life-- at least some of the time. I’ve been told this is certainly the case with sermons. I was reminded of this truism when I recall helping our children pack to go off to college for the first time. I couldn’t believe the amount of stuff they had accumulated, so many things, clothes, supplies, books, computers-- so many things-- it looked like they were packing up their entire lives somehow thinking they could fit it all into half of a dorm room—so much stuff— less was certainly feeling like more to me. I remember once reading that on an eight-day trip to the United States with her Prince Charles, Camilla packed 50 dresses. And, of course, there’s always the story about the number of shoes Imelda Marcos had accumulated, some 3000 pairs! What was scary to me upon hearing that astronomical number was not that I thought it was too many pairs of shoes, but that I understood how that could happen! I think we sometimes get lulled into a sense of comfort and security by the material things which surround us. George Carlin, though, is really the one who made our obsession with stuff famous, or infamous. He explains: All you need in life is a little place for your stuff, ya know, everybody’s got a little place for their stuff. This is my stuff, that’s your stuff, that’ll be his stuff over there. That’s all your house is, he says, a place to keep your stuff. If you didn’t have so much stuff, you wouldn’t need a house. You could just walk around all the time. A house is just a pile of stuff with a cover on it. Sometimes, he says, you gotta move to a bigger house. Do you know why? No room for your stuff anymore! And what happens when you go on vacation? You gotta take some of your stuff with you—a second version of your stuff which you take across the continent on your way to Honolulu. You get there, open your suitcase and you put all your stuff away, and you start to feel okay, because after all, you do have some of your stuff with you. And then your friend calls from Maui and says, Why don’tchya come over to Maui for the weekend and spend a couple of nights over here? Oh, no! Now what do I pack, you ask? Right, you gotta pack an even smaller version of your stuff— the third version of your house…. And so it goes. All this stuff we think we need as we surround ourselves with material things. Somehow we feel more secure with all of it, and that is so ridiculously silly and understandable. But this is not how it has always been in Jewish life. The story goes that the Rabbi of Berlin, Rabbi Zvi Hirsch Levin, was once asked by the Duke of Mannheim why on Passover the Jews recite Mah Nishtanah, Why is this night different from all other nights? After all, he wondered, shouldn’t this question be asked instead on the holiday of Sukkot, when we leave the comfort of our homes and dwell outside, exposed to the elements in those miserable huts? The rabbi explained that it is not unusual for Jews to be homeless, to be capriciously uprooted by persecutors, to live with insecurity. “The enemies of the Jewish people throughout all time have consistently risen up to destroy us, many times evicting us from our homes. So, on Sukkot when we sit in temporary homes, this seems normal,” said Rabbi Levin. In other words, Sukkot is typical for us. What is atypical is living in homes of relative luxury surrounded by loads of stuff. 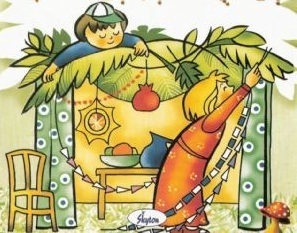 The visual imagery of this holiday is indeed embodied in the sukkah. 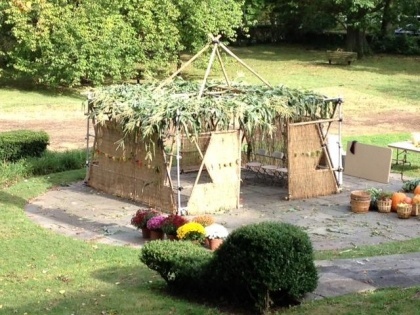 In a sukkah we feel unprotected, exposed to the elements reminding us of the fragility of life, and imbuing us with an understanding of what is of true importance in our lives. Actually, when we think about it, we are surrounded by coverings even in contemporary Jewish life. After all, a sanctuary protects us from the elements. A kippah is a covering, and so is a chuppah. And, of course, the original chuppah wasn’t made of flowers or lace but was chuppat shamayim, the sky. When we come into a service, many Jews place a covering around their shoulders, a Tallit, and some even place it over their heads while praying. But not all coverings are physical; the greatest ones in the Jewish psyche have been anything but material. Notwithstanding the comfort of our surroundings and the piles of the material stuff in our lives which tell us rightly or wrongly we are relatively safe and secure, even today Jews know the feeling of vulnerability. We think of our brethren in Israel on this Sukkot and wonder how different is their experience as they sit under the stars in their sukkahs living with the very real, existential threat of a nuclear Iran, a chemically laden Syria just over the border, a fiercely armed Hezbolla to the north, a Hamas-governed Gaza to the west and an unstable Egypt to the south. 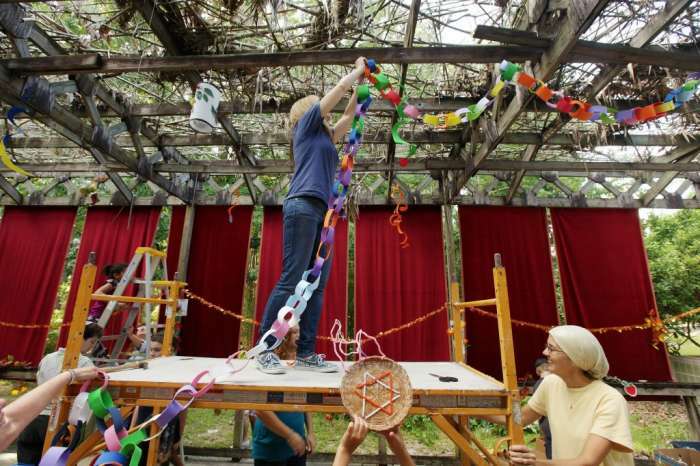 We should remember that a sukkah is fragile; in fact, it’s not allowed to be built as a permanent structure. Coverings are not forever and we who live in the relative comfort of our coverings should be mindful that while having a homeland protects those of us living in the Diaspora, we, too, have a responsibility to provide covering for those who live in Israel. Indeed, Kol Yisrael arevim zeh ba-zeh, all Jews are responsible for one another. When demagogues say they wish to destroy us, we should take them at their word. Israelis during this Sukkot have especially good reasons to consider their threatened existence as part of their normality. Jews over the millennia have understood that their greatest strength has been their reliance upon a vision which transcends the material always cleaving instead to a Godly vision of a world redeemed and co-partnering with God to make that happen. We can take our stuff with us but our greatest protection has always been based upon our relationship with God. 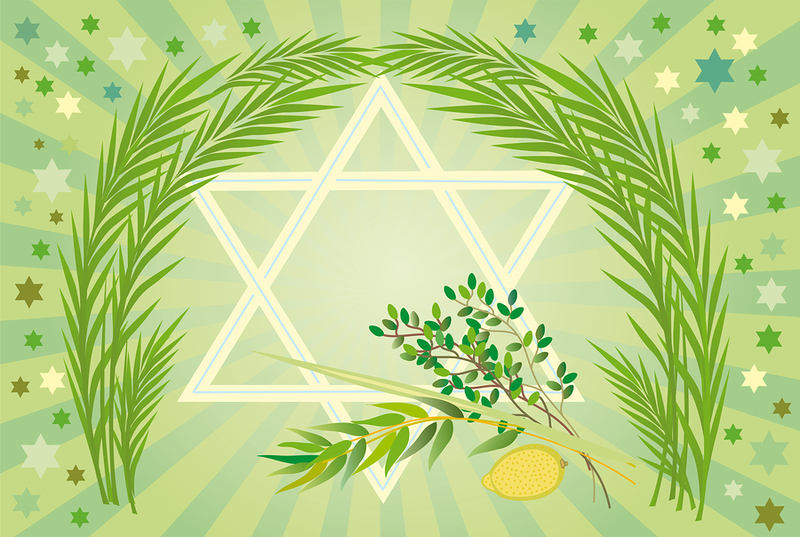 On this Sukkot, we pray for God’s sukkat shlomecha, God’s protective covering over us and over all of Israel. Keyn Yehi Ratzon. So may it be God’s will. Amen.